I want to tell you about an amazing organization helping a local community half a world away. NY Times' intrepid reporter and co-author of the incredible book "Half the Sky" (which you'll learn more about in a later post), Nick Kristof, tweeted a story last weekend about Chicagoans selling scarves to support refugee girls in Kenya. You can read the whole story here: "Shop Local, Help the World." This holiday season, buy someone a gift of one of these gorgeous handmade scarves and help support Heshima Kenya, a nonprofit organization that provides shelter and comprehensive support services for east African refugee girls in Nairobi, Kenya. Girls served by Heshima make the scarves as part of the organization's Maisha Collective, a program that teaches business skills to girls who have completed tailoring and financial literacy training. All profits from the sales of the scarves are returned directly to Collective participants as weekly wages and support of their ongoing engagement in Heshima Kenya's education and shelter programs. 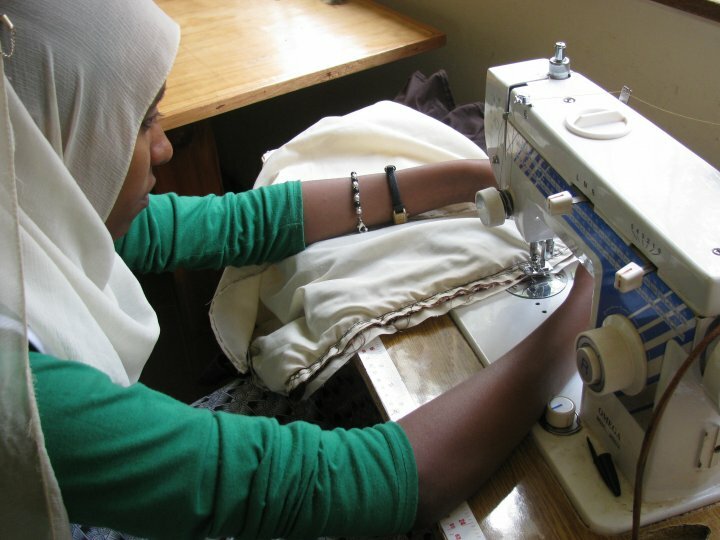 The Maisha Collective, a project of Heshima Kenya, empowers refugee girls and young women from DR Congo, Somalia, Ethiopia, Sudan, and Burundi with economic opportunities to rebuild their lives with peace and dignity. 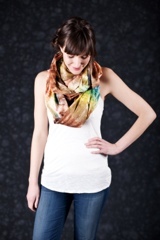 By managing a business collective that designs and produces a line of unique hand-dyed scarves, participants gain life-long business and marketing skills that develop their confidence and prepare them for future independence. Of the 60 girls currently served by Heshima, 18 participate in the collective and 10 of them are now self-reliant. Excuse me while I editorialize for just a moment, but I think that is amazing. During the last of couple years a strange phenomenon has occurred. Moustaches mysteriously sprouted on thousands of men’s faces during the month of November, in the US and around the world. It's not evolution or hibernation, folks...it's Movember. Men start Movember 1st clean shaven, and then for the rest of the month, these selfless and generous men, known as Mo Bros, effectively become walking, talking billboards for the often ignored issue of men’s health. Movember raises awareness and funds for causes that support prostate cancer and other cancers that affect men. The funds raised are directed to programs run directly by Movember and their men’s health partners, the Prostate Cancer Foundation and LIVESTRONG, the Lance Armstrong Foundation. This month, the hubs is getting on the philanthropy bandwagon and literally putting his money where his mouth is (well, just above) and growing his own Movember 'stache (Matt Hooban if you're searching the site). He's gotten quite a lot of looks and started quite a lot of conversations, I must say. And that is the whole idea: getting men involved in their own health and changing attitudes and habits relating to men’s health. 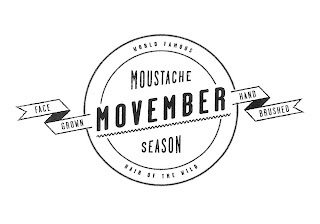 Via the moustache, Movember aims to fulfill its vision of having an everlasting impact on the face of men’s health by continuing to spark conversation and spread awareness of men’s health issues each year. And that's working, too. Last year, Movember raised over $80 million by over 400,000 participants around the globe. 83% of raised funds go toward programs supporting prostate cancer and other cancers effecting men. It's fairly certain that if you ask around, you will find someone who is participating in Movember, and you can support them by making a donation. If you don't know anyone, might I suggest you donate to a certain husband of mine? I also know a couple more awesome moustached gents who could use some donations, too. Or, you can just make a general donation. Here's are what I think are the most important takeaways from this campaign: 1. Men are awesome givers, too. And not just of their money, but of their time and even their faces. 2. Most cancers are highly curable if caught in the early stages - including prostate and testicular cancer. Early detection, diagnosis, and effective treatment are vitally important and will ultimately reduce the number of deaths from cancer. This story is a great example of how far astray we've gone from the spirit of giving during the holidays: "What Our Society Has Come to: Pepper Spraying Each Other for Video Games at Wal-Mart." 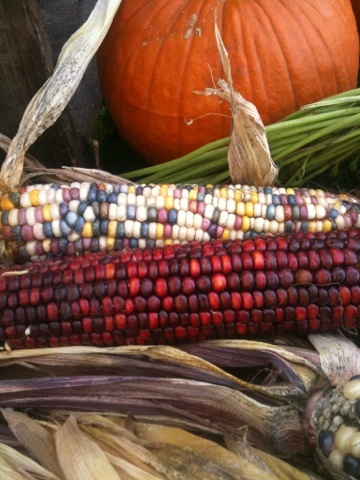 Happy Thanksgiving, friends! A year ago (tomorrow to be exact), I started this little blog to encourage people to think about giving more than just games and toys to their loved ones for the holiday season. This year (Hello!) I ask for more of the same. I think that given the current economic climate and some of the most destitute conditions for some people on the planet that we've seen in our lifetime, it's more important than ever that we reach out and make an effort to help those in need. In my continued effort to make the world a little bit better, I will endeavor to post about a different cause, organization, or charity every day between now and Christmas. My hope is that one will call out to you and you will respond by helping them do their good work, either in your name or on behalf of someone else. Most of us don't really need more stuff...but there are people out there who need so much - and a little bit can often go a long way. So, let's get to giving again, shall we? Along the way, please let me know if you have feedback or ideas. And thank you to those of you who have already given me so many great ideas! Happy Giving, y'all! Another college friend, Kara, pointed me in the direction of this adorable charity. As part of Sprout's Kindness Counts prosocial initiative, they have partnered with The Pajama Program to deliver new PJ's and new bedtime books to children in need. The website has this awesome tab called "Teach Kids About Giving" which is, in itself, worth visiting. For those of you not in the know (me included until just now), Sprout is a 24 hour preschool television channel that "parents and kids share together." You know, Barney, Bob the Builder and the like. Kindness Counts: http://kindnesscounts.sproutonline.com/ "because small acts matter big." Organize your community to help collect new books and PJs through a local school, church or other organization. We have printable posters and flyers, along with other materials to make the experience easy and fun. Invite friends and family over for some nighttime fun – during the day! Wear your PJs and collect donations for children in need. We’ll help get your party off to a great start with printable invitations, party activities and more. Send a monetary donation via check or credit card, mail in the new PJs and new books you’ve collected, or purchase items directly from the Pajama Program’s Amazon Wishlist. Their mission is to provide a loving environment for children who have lived through a great deal of hurt in their young lives to give them hope for better tomorrow. The program identifies key institutions in major cities in the US and other countries where children are living temporarily as they wait and hope for adoption. It is to the children in these circumstances and temporary living quarters that the pajamas are delivered with love and affection. The Pajama Program was founded in 2001. The Pajama Program depends on the generous support of volunteers, supporters, event hosts, pajama drive sponsors, and, of course, donations of cozy new pajamas and new children's books. According to their website, they've given away 891,808 new pajamas and 511, 599 new books since 2001. A little tweet from GOOD caught my eye the other day. It read, "2 hrs left to join our Document Gratitude challenge! Send us a photo of what you are grateful for to win $300." I can come up with at least a frillion things that I'm grateful for right off the top of my head, but one particular photo always sticks out in my mind. This is our kitty, Minnie. We rescued her this summer and she has been the light of my life ever since. I am so grateful for her every day, so I submitted this picture of her for the Challenge. I noticed that a lot of the other submissions were talking about organizations they support, so I figured that this would be a fantastic way for me to pay some stuff forward. In my submission titled "Unconditional Love", I mention that I would give some of the prize money to the rescue organization that brought Minnie into our lives, The Animal Project. 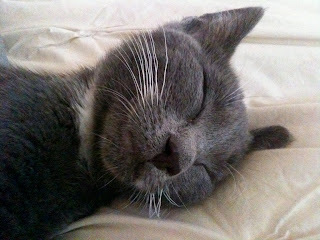 The Animal Project is a wonderful, NYC-based organization that tries to find homes for rescued cats every day. They have foster families all over the city that take care of rescued animals to save them from overcrowded & kill shelters. You can help The Animal Project save precious little lives by adopting a pet! Every Saturday you can meet their adorable, adoptable animals at PETCO on the corner of 92nd Street and Broadway in Manhattan from 2 - 6pm. They mostly have cats for adoption but occasionally they have dogs as well. You can also help by becoming a friend on Facebook and spreading the word about their adoption events and encouraging everyone you know that may be thinking about adopting a pet to RESCUE an animal. They'd also be happy with some cold, hard cash donations, so no excuses for being allergic. Not all animals are lucky enough to land with a rescue organization like The Animal Project, so they end up in city shelters. 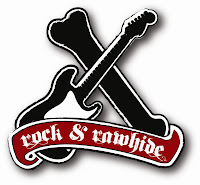 That's where Rock & Rawhide does its great work. This new charity was started by a friend of mine after she dropped off a rescued kitten at a city shelter and was heartbroken to see the poor animals on death row spending their last days of life in cold, empty cages. She started Rock & Rawhide to collect donations of toys, rawhides, treats, blankets, and more for dogs and cats placed at Animal Control and other high kill shelters. They plan to enlist artists who will help them collect items at concerts, local music gigs, touring bands, DJ events, art shows, chef events, direct from individuals and are working to raise awareness of adoption and the importance of quality of life for shelter animals. According to Rock & Rawhide, "Many shelters do not give the animals these items as they are cash-strapped and money is often spent elsewhere. While other organizations raise funds for shelters operating costs, we want to ensure the animals directly benefit...not someone's pocket." You can help them by following them on Facebook or Twitter to find out where to donate items, or you can make a donation to purchase items for the animals. If you do nothing else, at least do a little Gratitude Challenge of your own today and think of or take a photo of something that you're grateful for. You can also check out all the other things that people are grateful for in the GOOD Gratitude Challenge here (AND THEN VOTE FOR ME! ).